Laura Stein Interiors is an award-winning firm that crafts exclusive interiors for private luxury homes. Creating exceptional beauty that enriches and inspires, our designs celebrate the refined lifestyles and discerning tastes of our clients. Based in Toronto, our boutique-style firm caters to those looking for exquisite quality, insightful experience and unparalleled service. •We won! 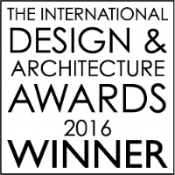 Five of our projects were shortlisted, but our Forest Hill Bedroom design won the 2016 International Design & Architecture Award in London!